Flat rock scorpions are native to South Africa. 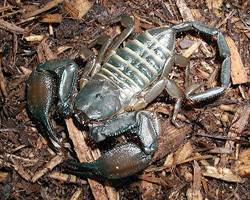 The majority of the sixteen species of this scorpion live there. These scorpions are large averaging seven inches. They have large strong flat pincers well adapted for grabbing prey in cracks. When you first lay eyes on these scorpions they appear so flat it looks like they have been squashed. Most are docile, slow to run, rarely sting, and the venom is very low in toxicity. It is a good pet for the novice collector, but are more easily injured than emperor or forest scorpions. A tank that is ten gallons in size makes a good home for the flat rock scorpion. A heat pad under one side of the tank will be needed. The habitat will require a shallow water bowl and hiding areas. The hide areas should be narrow and tight fitting. Well secured stacks of rocks or slate available at most pet stores work well. The substrate will need to be 2-4 inches deep and comprised of Eco-earth, sand, or something similar. Only one scorpion should be kept per habitat due to their territorial nature. A good diet consists of gut loaded mealworms and crickets.